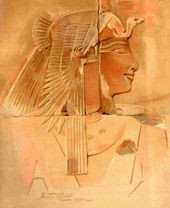 Most of the characters who appear in the Hatshepsut Trilogy were real historical individuals, and their authentic ancient Egyptian names are used in the books. However, some of these names can be real tongue-twisters! You can hear how they are pronounced by clicking on the HEAR THE NAME button next to each entry. No one knows for certain how the ancient Egyptian language was pronounced, though, so if you say the names differently it doesn't really matter! The names of wholly fictional characters are marked by an asterisk. Real characters whose names have been lost to history, and have been given fictional names, are marked with a dagger. 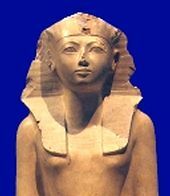 Hatshepsut's great-grandmother and mother of Ahmose the Liberator. (Amenhotep I) Second king of the Eighteenth Dynasty; predecessor of Tuthmosis I. Admiral of the Royal Fleet. Tomb EK5. (King Ahmose I) First king of the Eighteenth Dynasty; revered for driving the Hyksos oppressors out of Egypt. Great Royal Wife of Tuthmosis I, mother of Hatshepsut. God's Wife of Amen, Hatshepsut's aunt; sister and wife to Amenhotep I. Tomb DB 341. 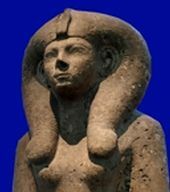 King's Great Wife of King Ahmose I and the first God's Wife of Amen. Army General with a military career spanning the reigns of Amenhotep I to Hatshepsut. Tomb, EK2. Kushite princess and sister of Sesebi. 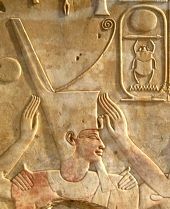 High Priest of Amen in Karnak during early Eighteenth Dynasty. (Name usually written without hyphens.) Tomb, TT97. King of the Hyksos; father of Herit. Captain of Hatshepsut's bodyguards. Tomb, TT200. One of Hatshepsut's closest friends with a long career in the priesthood. Tomb TT 67. Daughter of King Tuthmosis I and Queen Ahmose; God's Wife of Amen, wife and sister of King Tuthmosis II; King of Egypt ca. 1479 BC to 1458 BC. Tombs: Carter No.22 in Wadi Sikket Taqet Zaid and KV20. Hyksos princess, daughter of Apophis. Vizier under Tuthmosis I, Hapuseneb�s grandfather. Tomb WV46. Vizier and Chief of Works for King Djoser (Third Dynasty); revered as a sage and patron of healers. Chief of Works and Chief Royal Architect. Tomb TT81. Hatshepsut's nurse. Inet was the nickname of the Lady Sitre. Tomb, KV60. Divine Adoratrice, daughter of High Priest Amen-em-het; later, wife of Hapuseneb. Concubine of Tuthmosis II, mother of Tuthmosis III. Ship's Captain of the God's Wife. Daughter of Huy. Tomb KV42. 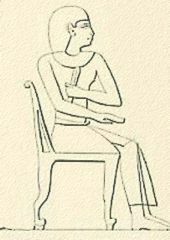 First wife of Tuthmosis I, mother of Wadjmose, Amenmose and Tuthmosis II. Hatshepsut's daughter. Tomb C, Wadi Gabbanat el-Qurud. 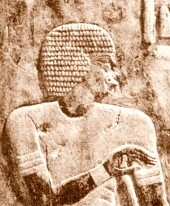 Prince of Wawat in Nubia, one of Hatshepsut's closest friends. Tomb I.6, Saqqara. Mayor of Nekhen. Tomb EK3. Kitchen hand, brother of Tanef. Steward at Per-Tashey, later Second High Priest of Amen. Tomb TT39. Army scout; later chief advisor and lover of Hatshepsut, tutor of Neferure. Tombs: TT71, DB353. 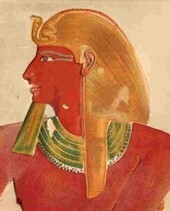 Half-brother of Senenmut. Tomb: TT252. Daughter of Hapuseneb and Ipuky. 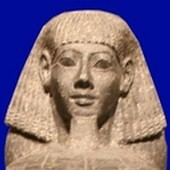 Female King, last ruler of the Twelfth Dynasty. Daughter of Huy and Amenmose. Wardrobe mistress and body servant of Hatshepsut. In these books, a nickname for Hatshepsut's brother, Tuthmosis. Not connected in any way with the famous King Tutankhamen ('King Tut') who ruled about 120 years later than the time span covered in the Hatshepsut Trilogy. Hatshepsut's half-brother and husband, fourth king of Eighteenth Dynasty. Tomb: possibly KV39. Son of Tuthmosis I and Mutnofret.